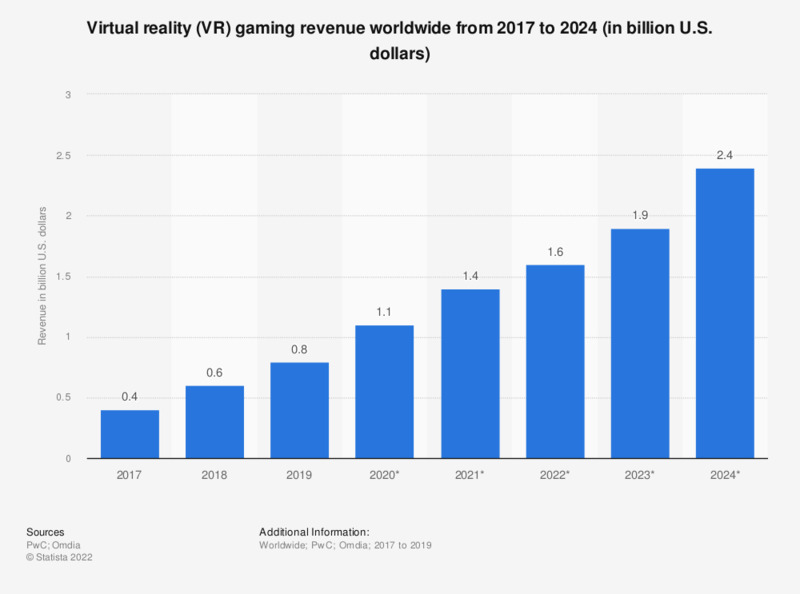 The graph presents data on the virtual reality video gaming sales revenue worldwide from 2015 to 2020. The source estimates that the global VR gaming market size in 2016 will be worth 3.6 billion U.S. dollars. This number is expected to grow to 22.9 billion by the end of 2020. Europe and North America are the two biggest markets for virtual reality video gaming. The European market is valued at an estimate of 1.9 billion U.S. dollars in 2016. The North American market, led by the United States, is projected to be worth 1.5 billion U.S. dollars in the same year. Between 2016 and 2020, mobile VR gaming sales are expected to show the highest growth in sales revenue, followed by the PC and console segments. Adventure, action and simulation games seem to be the most popular VR gaming genres as more than 50 percent of gamers said they were interested in such VR games in late 2016. The figure for 2015 comes from a previous release.